Who is This in Sydney? Interesting to see this picture from “Mr. Walker“. It’s of a photographer in Sydney, shooting street scenes in naturally reflected light (a la No Flash Corner) with a big camera & cable release. That’s hilarious. Yes, I do. 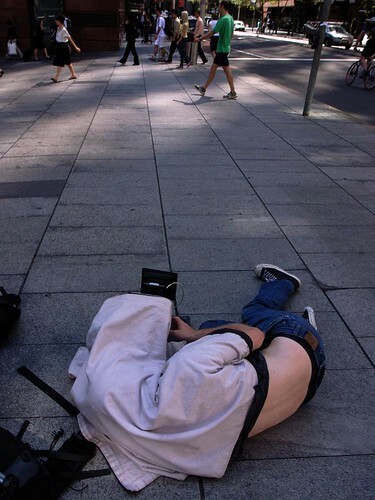 Obvious guess…but maybe Trent Parke? No, but I bartended a block away from there. Too bad I didn’t shoot back/down there. AND he absolutely swears by black undies “On account of what they hardly need any laundering”. ” Fliegen Sie mich zum Moon” währenddessen, spinnend hinunter die Straße, die Leute fotografiert. I think that might just be no tripod corner. Trent Parke perhaps, his kind of subject matter. Probably not Trent, given he lives in Adelaide. But he sure is skinny enough to be Trent! Th@fred doesn’t live in Australia, but Austria and he can usually be seen on the street with a 4×5, and usually lying on the ground! No, its not really him.